The administrator for Region 7 of the U.S. Environmental Protection Agency told participants at the 2007 Fuel Ethanol Workshop in St. Louis this week that the partnership between EPA and agriculture is helping to find solutions to environmental challenges. Askew concluded his remarks by presenting EPA’s Energy Star awards to Macon Municipal Utilities in Macon, Missouri and Adkins Energy, LLC in Lena, Illinois. 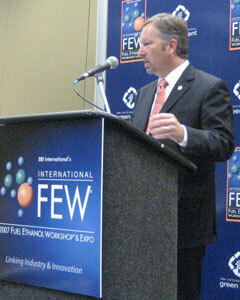 Thanks to the Renewable Fuels Association for sponsoring coverage on Domestic Fuel of the 2007 Fuel Ethanol Workshop.